Blueprint Growth seeks capital appreciation over full market cycles while generally maintaining broad global diversification. The strategy is dynamically managed, striving to take advantage of global market opportunities while focusing on downside risk management by changing allocations in response to market conditions. The strategy consists of two portions, strategic and tactical, both of which are dynamic in nature. The strategic allocation is broadly diversified across eight asset classes attempting to take advantage of opportunities across global capital markets, while the tactical portion adjusts portfolio allocations with risk management as the primary objective. Blueprint Moderate Growth seeks capital appreciation over full market cycles while generally maintaining broad global diversification. The strategy is dynamically managed, striving to take advantage of global market opportunities while focusing on downside risk management by changing allocations in response to market conditions. Blueprint Balanced seeks capital appreciation over full market cycles while generally maintaining broad global diversification with moderate levels of risk. The strategy is dynamically managed, striving to take advantage of global market opportunities while focusing on downside risk management by changing allocations in response to market conditions. Blueprint Conservative seeks capital appreciation over full market cycles while generally maintaining broad global diversification with conservative levels of risk. The strategy is dynamically managed, striving to take advantage of global market opportunities while focusing on downside risk management by changing allocations in response to market conditions. Blueprint firmly believes that transparency and independent verification are crucial to establishing and maintaining trust, and ensuring accurate, reliable information. So what does it mean for us to say we are GIPS® verified? Two separate, independent firms are used to prepare and verify our composites. An independent consultant joins our compliance team in ensuring that all of our procedures and practices are consistent with the standards. An independent firm performs an annual verification of the performance for Blueprint strategies. 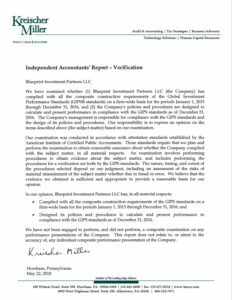 GIPS® BLUEPRINT CLAIMS COMPLIANCE WITH GLOBAL INVESTMENT PERFORMANCE STANDARDS (GIPS®). TO OBTAIN A COPY OF A COMPLIANT PRESENTATION AND/OR A LIST OF BLUEPRINT’S COMPOSITE DESCRIPTIONS, PLEASE CALL 1-800-765-6936.